:All too often prayer feels awkward and complicated. The truth is, it should be simple. It's like talking with a good friend. 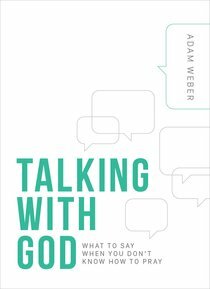 Down-to-earth pastor Adam Weber offers an accessible, humorous, and hopeful approach to one of life's greatest mysteries: talking with God. :Me: How would you best describe prayer? Roger Fredrikson: Talking with God. A few weeks back, I received an e-mailfrom a friend asking if we could get together. I could tell by his words that there was something specific he wanted to talk about. I arrived a few minutes early, ordered the usual&mdash;dark coffee with one Splenda&mdash;and found a table near the front that was perfect for people- watching. Twenty minutes later, my friend arrived. He apologized for not being on time. His life is busy as he tries to be seventeen different places at once. He&rsquo;s getting his career off the ground. He&rsquo;s a dad to two young kids. And then there&rsquo;s his marriage. &ldquo;I never thought it would all be so much work,&rdquo; he shared with me. He wore a smile, but you could tell his life was crazy. He was overwhelmed. As my friend talked a million miles an hour, I was hoping he&rsquo;d take another breath so he wouldn&rsquo;t pass out. I could tell he was embarrassed and felt foolish, yet he was curious and wanted to know how to pray. I was grateful my friend was so candid and real, and honored that he trusted me enough to ask his question. But, honestly, this wasn&rsquo;t the first time I&rsquo;ve been asked this question. Far from it. &ldquo;Everyone else&rdquo; . . . they probably have prayer figured out. At least the faith- ful churchgoer does. And if no one else, the pastor does, right? I can&rsquo;t speak for others, but I know I don&rsquo;t. And I&rsquo;m paid to know this kind of thing. Again, even followers of Jesus&mdash;the people who hung out with Jesus himself&mdash;didn&rsquo;t have prayer figured out. Jesus wouldn&rsquo;t have talked about it with them if they had. I&rsquo;ll go out on a limb and say that the majority of &ldquo;everyone else&rdquo; doesn&rsquo;t have prayer figured out either. They have questions. They feel unqualified or in- adequate. They avoid prayer altogether. After all, how do you talk with the Creator of the entire universe without feeling a little intimidated? And so, I offer this book to you. It&rsquo;s a book on prayer for everyone else. It&rsquo;s for the church outsider. The recognized sinner. The baptized and confirmed Christian. The faithful churchgoer. The follower of Jesus who feels like she falls short and the Pharisee Christian who thinks he doesn&rsquo;t.
This book is for those who, just like my friend, have a crazy life. It&rsquo;s for those who have a bunch of questions and very few answers when it comes to prayer. It&rsquo;s for everyone who isn&rsquo;t looking for a textbook explanation, a theological discussion, or even a definition of prayer. But instead is looking for a conversation about prayer they can understand and relate with. A conversation that meets them right where they are, not where they feel like they should be. This book is for everyone else who is curious about prayer. This book is for everyone else who wants to talk with God. This book is for me. This book is for you. Tell God all that is in your heart, as one unloads one&rsquo;s heart, its pleasures and its pains, to a dear friend. Eyes closed. Hands folded. Don&rsquo;t move. And be as quiet as you possibly can. At least as quiet as a five-year-old can be. When I was growing up, prayer was something we did only before we ate and before we slept. Even though my mom has always been a bit of a wild driver, we never prayed before driving anywhere. Even though bullies were a legit concern for me at recess, we never prayed before going to school. We never prayed randomly throughout the day. We prayed only before eating and sleeping. Is there something I should know about the food I&rsquo;m eating? What is wrong with this meatloaf? Is this my last meal? Maybe monsters really are real and they come out once it&rsquo;s dark? Is someone trying to kill our family at night? Is there a reason we pray only before we eat and &#160;sleep? And when we prayed, we prayed the same exact words each and every time. We recited the words having no idea of what we were really saying. Repetitive. Redundant. It&rsquo;s just what we did. Before bed, because my dad typically worked late, my mom would come into our room to pray with us. When we were kids, my two brothers and I shared a bedroom on the second floor of our old house.1 The three of us were busy! Busy is putting it nicely. That was until we prayed. We had to be serious when we prayed. We knew we shouldn&rsquo;t talk or move. Or even breathe. Thankfully, our prayers were always short and sweet. In church, however, it was a different story. And my family, the Webers, never missed church. Ever. All of us dressed in our Sunday finest. Shirts tucked in. Hair combed. Walking through the old front doors, my parents knew everyone, including the pastor. Green hymnals. Red carpet. A large wooden pulpit thing up front. An organ was off to the side. And there were wooden pews that made your rear hurt. My family sat on the right side of the room. In the same pew every week. I sat with my short legs swinging back and forth under the pew, staring at the gray hairs on the neck of the person in front of me. To pass time, each week I counted every light on the ceiling of the sanctuary. I used to think, If there is a God, we have to be boring him out of his mind. I wondered if he actually listened to our prayers, because when we spoke to him, it wasn&rsquo;t like we expected a response. We didn&rsquo;t expect anything to happen. When we prayed, it seemed to be more about a box we checked. A hoop we jumped through to make some far-off being happy with us. Who or what were we praying to? Ourselves? The thin air? I didn&rsquo;t know. From an early age, I thought all of it was strange. Praying. Church. God. Baby Jesus. All of it. Weird! My questions and doubts only continued to grow. If God was truly amazing, if he was really awesome, why were we so miserable every time we talked about him? Why didn&rsquo;t this supposed all-powerful God ever seem to do anything? Other than the one hour on Sunday mornings and a few quick prayers before eating and sleeping, why was he absent from our lives? Away from Sundays, it felt as if we were embarrassed to even mention God. Even as a fourth grader, I knew that if something was awesome&mdash;a cute girl, a cool old car, next week&rsquo;s football game&mdash;it impacted me. I mean, with a cute girl, I couldn&rsquo;t talk straight around her. She was so cute and beautiful and awesome. She didn&rsquo;t bore me at all. Just the opposite. I couldn&rsquo;t stop talking about her. By my freshman year of high school, I started to become more vocal about my questions. I also started what every Lutheran kid does: confirmation. A required two years of learning the basics of the Christian faith. At the end, you &ldquo;confirm&rdquo; your faith in God. It was two years of pure agony. Lord, help! My clearest memory from confirmation is of having to pick a memory verse. I picked John 11:35, the shortest verse in the Bible&mdash;&ldquo;Jesus wept&rdquo;&mdash;but was told by my pastor I couldn&rsquo;t pick that one. I had to choose another. Ironically, I can&rsquo;t remember the other verse I chose, but I still remember John 11:35. That was the extent of what I learned in confirmation. The day I got confirmed, my family showed up early at the church to save seats. For our small church, this was one of the biggest Sundays of the year. My friends and I wore white church robes. We each had a carnation pinned on just right. The church began filling up with family. My godparents came from North Dakota. Family came that I didn&rsquo;t even know I had. During the service, my friends and I marched to the front of the church and declared our belief in God. Following the service, we had a reception at our house. After eating cake and hugging a bunch of people I barely knew, I watched as everyone left the house. It was then that I told my parents what I had been thinking the whole time. &ldquo;This is the biggest lie I have ever told. And to so many people at one time.&rdquo; During the service, I had said that I believed in Jesus, but I clearly didn&rsquo;t.
They had done everything right. They faithfully brought their kids to church every Sunday, and yet I wanted nothing to do with it. From that moment on, my parents began looking for a church that I would connect with. They set aside their own preferences and everything they knew when it came to church. We tried every church in Clark, South Dakota,4 all six of them, and then we looked at every church outside of town. There was a tiny country church where the sermons were only eight or so minutes long. I didn&rsquo;t mind that one, solely because of the shorter service. After being invited a few times to a church in another town about thirty minutes away, my parents decided to try it.5 I thought they were nuts. Thirty minutes one way? That seemed absolutely crazy. But I&rsquo;ll never forget our first Sunday there. Walking up to the church, I followed behind my parents, telling them just how stupid this was. Why in the world did we just drive thirty minutes for church? Who does this? It was the first nontraditional worship service I had ever attended. They weren&rsquo;t speaking in tongues or handling snakes, but for this Lutheran, the people all seemed nuts. I felt like a kid at a zoo, seeing strange-looking animals for the first time. People were clapping, one person had his hands in the air, and they all looked happy. Maybe a little too happy. Are they serving Kool-Aid? I wondered. You can&rsquo;t smile in church. Stop smiling! They didn&rsquo;t have hymnals. My backside didn&rsquo;t hurt from wooden pews. And the music didn&rsquo;t make me want to cry tears of boredom either. Where was I? I also noticed that they prayed differently. It was as if they were speaking with God, not at him. I had never heard people pray like that before, let alone done it myself. Ever. So strange. Even though I thought they were all crazy, I also couldn&rsquo;t help but notice all the cute girls in this church.8 They attended Watertown High School, which was much bigger than my own. Watertown was the big city to this small- town kid. I wasn&rsquo;t into Jesus, but the Watertown girls? That was a different story. I wasn&rsquo;t counting ceiling lights in this church. Now I was counting cute girls. Knowing that going to church was an inevitable reality until I went to college, I told my parents we should come back to this church each and every week. They were thrilled that I was so interested in girls. I mean, church. Obviously. Regardless of my reason for wanting to attend that church, God used it to slowly begin working in my life. For the first time, the pastor&rsquo;s words no longer flew over my head each week. Instead they began to hit me in the heart. The pastor was doing a great job selling something I didn&rsquo;t believe in. And over time, something began to change. Each Sunday, it was like he was speaking right to me. As if he were reading my mind or something. How did he know so many of the things I had felt but never spoken? I started hanging out with some of the girls and a crew of the guys, and after a while they began to invite me to their youth group on Wednesday nights. What was a young guy to do? Choose to attend only the Weber family requirement of Sunday morning church or possibly see more of these cute girls? Hormones won, and I gave in. I remember thinking: I am actually choosing to go to church? Am I feeling okay? What am I doing? That night I went to youth group hoping to meet a girl. Little did I know that I would end up finding a friend. The room was packed full of kids my own age. Everyone was having a blast. They actually wanted to be there. We sang a few songs and then the youth pastor began to talk. He was right out of college and seemed normal&mdash;the first normal pastor I had ever seen. And that night, out of all things, he began to talk about prayer. Really? Prayer? The very idea of prayer made me want to fall asleep. I had been closing my eyes and mumbling prayers my whole life; what else did I need to know about it? But what he shared about prayer that night was different from anything I had heard before. He said, &ldquo;When talking with God . . .&rdquo; Wait! When talking with God . . .&#160; &#160;? I thought this message was about prayer, about saying the same thing I had said my entire life before eating a meal or sleeping. I thought this was a talk on rambling through the same old words each Sunday while trying not to fall asleep. But he said talking with God? &ldquo;When talking with God, there are different ways to pray.&rdquo; He continued, &ldquo;Sometimes you have to sing because you&rsquo;re so excited and thankful for what God has done. You can&rsquo;t hold it in; you have to sing it. mistake and you&rsquo;re saying you&rsquo;re sorry, or you&rsquo;re pouring out your heart to him. It was the last thing I heard the youth pastor say that night. You can talk with God? Like a friend? Really? The God who supposedly set the stars in place? The One who supposedly created me? You can talk with him? This is what prayer is? It might seem like common sense to you, but to me it was foreign. This was different from anything I had ever heard about prayer. It was different from anything I had ever heard or known about God. The moment I heard it, it was as if my heart leapt within me. I felt like I had found something I had unknowingly been searching for my whole life. The remainder of the night, I sat emotionless, trying to process what I was being told. We can talk with God? Approach me. Come near to me. Talk with me. As a friend. Hear this: not only are we able to talk with God, but we can speak with him&#160;as we do with friends. And not only are we able to be his friend, but he initiates that friendship with us. He initiates it with you. With me. Again, maybe this is no big deal to you. Maybe you&rsquo;re totally secure with who you are as a human being that you haven&rsquo;t ever struggled with finding friends. But I&rsquo;ve always struggled with wondering whether or not I fit in. Do I belong? Am I liked? Beyond that, am I loved by others? Do people want to be my friends? Instead of having to impress people. Instead of wondering if they approve of you and enjoy hanging out with you as much as you do with them. Few things feel better than hearing someone say he wants to be your friend. Not only are we able to talk with God, but he wants to talk with us. Not only are we able to be his friend, but he wants to be ours. That Wednesday night after youth group, halfway through the thirty-minute drive back home, I pulled my 1966 Ford Falcon Futura to the side of the road.14 I opened my car door, got out, and just stood there as the other cars passed. Even the skeptic in me couldn&rsquo;t deny what I felt inside. It wasn&rsquo;t hormones. Something was happening within me. My heart and mind were racing with questions. We can talk with God? Like a friend? Really? Looking back, it was the first time I ever truly prayed. It was the first time I had ever really talked with God. In that moment, I just wanted to know if he was who he said he was. If he existed. If he was real. I just wanted to know if I could talk with him. My first time at youth group, I was hoping to meet a girl. Instead, I met someone who would end up becoming a friend. A guy named Jesus. I didn&rsquo;t know then it was a friendship that would change my life. Prayer seems like it should be simple. Yet when it comes to actually praying, it often feels awkward and complicated. I mean, what should I actually pray about? Is there anything I should or shouldn&rsquo;t say? Do I have to speak out loud? Do I need to schedule a time with God&rsquo;s assistant before I can talk with him? I don&rsquo;t even know where to start. To make matters worse, we&rsquo;ve heard about prayer for so long that we feel stupid asking about it. It&rsquo;s like having to ask a person&rsquo;s name after knowing her for years. Because I really should know her name by now, I can&rsquo;t ask. Then comes the craziness that is my life. And probably yours as well. Between work, changing diapers, walking the dog, texting friends, trying to keep up with the neighbors&mdash;and the laundry&mdash;who has time to pray? But the truth is, prayer is simple. Kids are great at it. It&rsquo;s like talking with a good friend. It&rsquo;s like breathing. And what we may not know about prayer is the best part. Whether we&rsquo;re in the middle of a storm, living in Crazytown, or stuck in the mud, God can&rsquo;t wait to talk with me. With you. Long to connect with God but don&rsquo;t know how? Have a job, family, schedule, kids, deadlines, a full inbox, a million things to do, yet you&rsquo;re curious about how to talk with God? Do you wonder what it really looks like to pray in the midst of your life, or what to say when you don&rsquo;t know how to pray? I&rsquo;m asking the same questions.